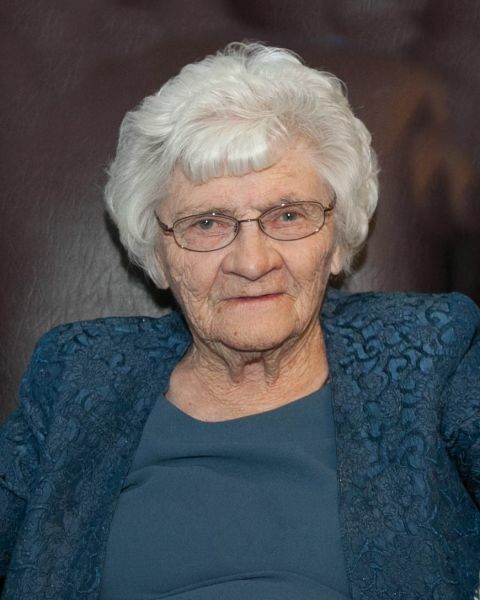 After a lengthy stay in CarmanMemorialHospital, Sophie Boyd passed away on August 20, 2015 at the age of 94. Sophie was born on December 26, 1920 in Dagero, Manitoba. Her parents, Nels and Catherine Sorenson had immigrated from Denmark in 1913 and settled on a farm in the Dagero area near Rennie. Sophie went to school in Ingolf, Ontario returning during the summer to work on the family farm. In 1940, she married Thomas Boyd and in 1945, they moved to a small acreage just outside of Sanford, to start a fur farm and to raise their family. Sophie, when not being a mother and a farm wife, was very active in the community serving as President and Treasurer of the local Woman’s Institute, assisting in the leadership of the local 4-H club, and teaching Sunday School at SanfordUnitedChurch. She was an avid supporter of the arena projects and was involved in the planning, building and ownership of Mandan Manor. She was predeceased by her husband Tom in 1990, her parents and her 7 siblings (4 brothers and 3 sisters). Sophie is survived by her five children; Stuart (Vera), Gayle Miller, Ken (Diane), Allan (Valerie) and Donald (Lauren); her grandchildren Janine Fraser (Darren), Chad Boyd (Amanda), Jeff Miller (Lora), Trevor Miller (Nicole), Laurel Lake (David), Tannys Miller, Krista Goodridge (Mitch), Michael Boyd (Chantal), Lindsey Boyd, Jamie Boyd (Kelly), Stephanie Curtis (Kyle), Kelly Boyd (Jodie) and Eric Boyd (Candace); and her great-grandchildren Kailee and Marisa Fraser, Laken and Deagen Boyd, Dylan Miller, Esme Hickey, Isaak and Tessa Goodridge, Mathieu and Monica Boyd, Joshua and Sydney Votto, Mackenzie Curtis, Rylan Jephcote-Boyd, and Claire and Lucas Boyd. Interment will take place on Monday, August 24, 2015 at 1:00 p.m. at the Sanford Cemetery. Funeral service will follow at the Brunkild Community Hall at 2:00 p.m. with Rev. Alan Armstrong officiating. In lieu of flowers, donations may be made to the Children’s Hospital Foundation, CE501-840 Sherbrook St., Winnipeg, MB. R3A 1S1 or to CancerCare Manitoba, 675 McDermot Ave. Winnipeg, MB. R3E 0V9. The family thanks the wonderful staff at CarmanMemorialHospital for the exceptional compassionate care that they provided to Mom during her stay.